We often encounter books about the wives of the U.S. presidents. We’ve seen a number of books about the presidents themselves. But what about the mothers of the presidents? 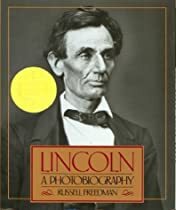 I am fascinated by Abraham Lincoln, and last month’s reread of Newbery-winner Lincoln: A Photobiography (reviewed here) only reinforced that. Anthologist and “historian of ideas” Joe Wheeler has also been fascinated by Lincoln, and he spent seventeen years studying the fascinating man and collecting stories about him. Abraham Lincoln: A Man of Faith and Courage is Joe Wheeler’s collection of favorite stories from the life of the sixteenth president, focusing on the development of Lincoln’s faith and morals. I was going to read Team of Rivals: The Political Genius of Abraham Lincoln by Doris Kearns Goodwin for the US Presidents Reading Project. But then I started to be intimidated by its 800+ pages; I’m currently reading a 700+ page book and I have been for three months. So, while I do plan on reading Goodwin’s book at some point, I thought I’d start a little easier with President Lincoln by going for some of the children’s books about our 16th president that have won the Caldecott or Newbery awards or honors.